How Far is Srivatsa Hill View Plot? Srivatsa Hill View is a residential project by Srivatsa Foundations. It has a thoughtful design and is well equipped with all the modern day amenities as well as basic facilities. 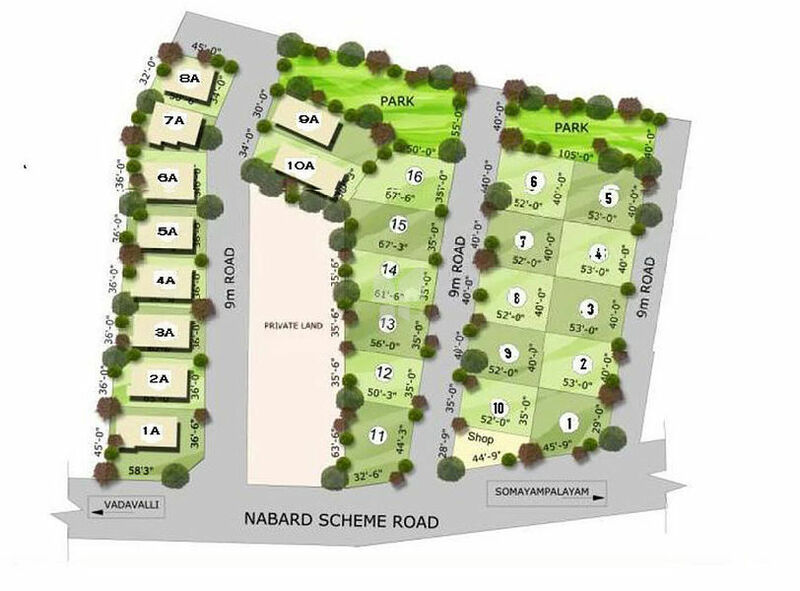 The project offers various odd dimensional plots along with 2BHK and 3BHK proposed villas. Srivatsa Foundations (P) Ltd. (SFPL), has been in the real estate business for over a decade. Having commenced operations with residential projects in suburban Chennai, the organization has grown steadily with over one million square feet in successfully completed projects including prime residential areas in Chennai. The company has also expanded its presence into Coimbatore and has undertaken projects there. Now on a rapid expansion programme the organization is poised to make an impact on the housing map of Chennai and Coimbatore.We have completed residential and gated community projects in Mylapore, Alwarpet, Velachery, Perungudi, Manapakkam and Tambaram in Chennai and off the Mettupalayam road and vadavalli at Coimbatore.The management control of the company is vested with highly qualified professionals with many years of experience in all facets of the industry. An architect and structural consultant are involved in the plan developments and design.The promoters of the company come with vast construction experience having undertaken development of townships for public sector undertaking like BEML&CLRI.They also have undertaken construction of one of the largest Diesel Engine Factories for BEML of half a million sq.ft area with long span (15mtrs)folded plate roof and high strength vaccum concrete flooring.The top Management is ably supported by a team of qualified Engineers from Premier Institutions and Business Management graduates.